ANKARA (APA)—Agreements to normalize relations and open borders between Armenia and Turkey will not be discussed in the Turkish Parliament’s Foreign Affairs Commission without Azerbaijan’s approval, said a deputy from the ruling Justice and Development Party (AKP), the Azeri Press Agency reported on Wednesday. “The protocols signed with Armenia will not be discussed in the parliament’s foreign affairs commission, if anything does not satisfy Azerbaijan,” Metin Yilmaz told APA’s Turkey bureau. “Our President and Prime Minister regularly contact Azerbaijani President Ilham Aliyev. If Ilham Aliyev says that the problems are being solved and it is high time for us to take some steps, we will include these protocols into the agenda of the commission,” he said, adding that the issue has already been discussed by Foreign Minister Ahmet Davutoglu and the commission’s chairman. “Our parliamentarians held discussions in Azerbaijan under the leadership of the chairman of our commission. We will not take any steps concerning the protocols unless we reach the stage of solution satisfying Azerbaijan,” he said. This is good for us….They are digging their own grave on the international scene….. The fact that Armenia-Turkish Protocols will not be discussed in the Turkish Parliament Commission without Azeri approval, in fact, is the last blow over Mr. Sarksyan’s infantile policy. 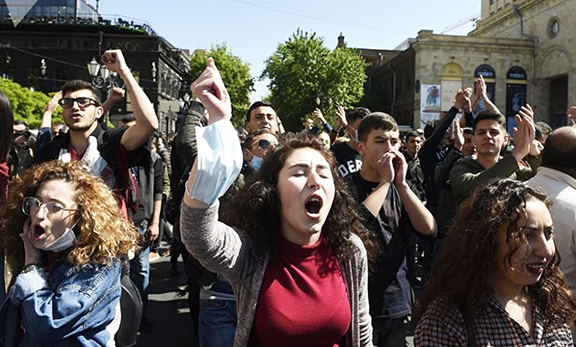 Will the illegal President Sarksyan tell the truth why he started that turmoil?